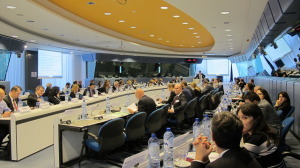 The Vienna Initiative 2.0 Full Forum met in Brussels in November 2014. Vienna Initiative partners met to discuss the Vienna Initiative's achievements over the past year, ongoing work and to outline the objectives for the initiative for the next year. A key focus of discussions was to work towards sustained credit recovery by accelerating balance sheet cleaning, reducing non-performing loans (NPLs) and boosting the use of credit enhancement schemes. The Forum also discussed options to enhance cross-border regulatory coordination between the recently established Single Supervisory Mechanism (SSM) and emerging European countries that are not already members, with a special focus on non-EU countries in South-Eastern Europe (SEE).